Midland/Odessa Sockers FC begin the season with a 3-0 win over the Lakeland Tropics of Florida in the 1st Rd of the Lamar Hunt US Open Cup. It was back and forth for the first 30 minutes of the match where the Tropics had more shots on goal than the Sockers FC 3-2. The tide turned on the Tropics in the 33' minute of the 1st half, when a penalty was committed by the Tropics to give Xavier Lao an opportunity at a penalty kick. Lao made it look easy as Tropics Goalkeeper, went to the right and the ball rolled to the left corner of the net for the first score of the game. Six minutes later the most impressive goal of the game came in the 39' minute of the match. The Sockers FC were threatning to score again in the box. A Tropics defender cleared the ball that ended up finding Sockers Midfielder Peter Dominguez all alone. Dominguez kicked a 30 yard strike that reached the upper left corner of the net, just out of reach of the Tropics Goalkeeper. Sockers FC now up 2-0. In the closing minutes of the 1st half, Sockers coach Luis Rincon made a calculated decision by substituting Jhonathan Valesquez. This move paid off as Xavier Lao found Valesquez left alone and he nailed a right footed kick that curved into the upper right corner of the net to put the Sockers up 3-0 just before half-time. This would be all the Sockers FC would need, as the Tropics could not find any answers to get passed the superb defensemen of the Sockers FC. The Sockers defensemen continuosly cut off angles of shots and passes from the Tropics and they never allowed the Tropics back into this match. Their next opponent will be the semi-pro team, San Antonio FC, whose coaches and scouts were viewing the game from the stands. 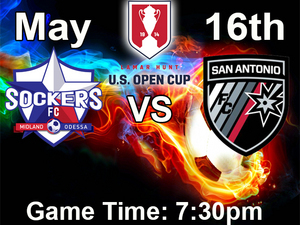 This match will be hosted here at Grande Communications Stadium Wednesday May 16th, at 7:30pm.